This topic describes how to work with both system-defined fields and user-defined fields (UDFs). This includes creating user-defined fields (UDFs), and changing field display labels. UDFs can be defined for shared spaces and workspaces. This overview describes how to work with shared and non-shared UDFs. UDFs cannot be defined at the space level when the space is isolated. Instead, admins for a workspace can define UDFs in individual workspaces. The UDFs are available in that individual workspace only. This table summarizes the actions admins can perform when defining UDFs in shared spaces and associated workspaces. The space admin can add and modify UDFs defined in the shared space. The UDFs are available to all associated workspaces. 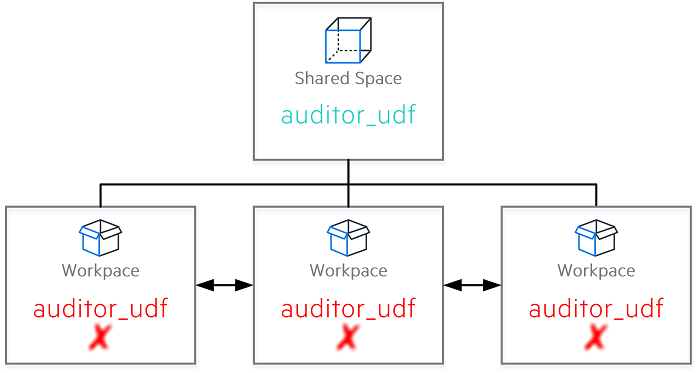 ALM Octane users working in a specific workspace can access both the UDFs defined for the corresponding shared space and also the UDFs defined specifically for that workspace. Shared UDFs are displayed with the icon. Admins for workspaces cannot modify shared UDFs. The admin for a workspace can add and modify these UDFs. The UDFs are available to that individual workspace only. Must UDF names and labels be unique? 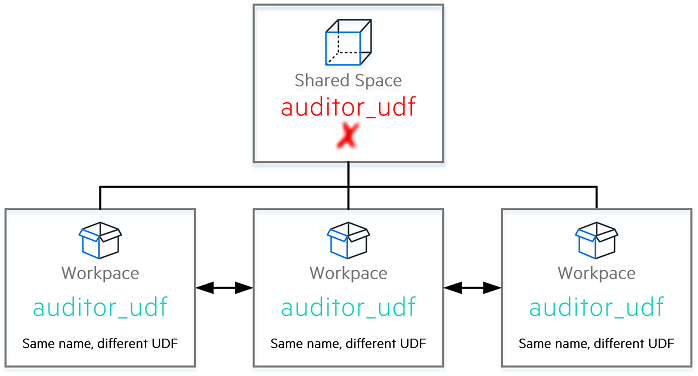 If a UDF is defined for an individual workspace, you cannot create a UDF, or define a label, with the same name in the associated shared space. You can create a UDF, or define a label, with the same name in other workspaces. In Settings > Spaces, select the shared space or the workspace where you want to create user-defined fields. In the Entities list on the left side of the pane, select the item (such as user story, manual test, epic, and so on) for which you want to create your own fields. Click + to add a user-defined field. A unique name that APIs will use to access this field. No uppercase letters or punctuation allowed. ALM Octane automatically adds the suffix _udf to the name of the field. Label A unique name for the field as you want it displayed in the UI. You can enter English, non-English, and special characters. Select the field type from the drop-down. Description Enter a description for the user-defined field. Limitations: UDFs can only be defined in English even if ALM Octane has been localized for a specific language. A total of 100 between the two types. Note: String fields can contain up to 255 characters. Note: Long string fields can contain up to 1500 characters. Note: You can modify this value by setting the MEMO_UDFS_LIMIT configuration parameter MEMO_UDFS_LIMIT. Select the list to use for the field. For details on creating your own lists, see Set up lists. If you want the user-defined field to contain multiple values, check the Allow multiple values check box. Select the reference field on which to base the new field's value. To add the user-defined field to existing forms, select the forms from the Add to form drop-down list. UDFs are available in ALM Octane like other predefined system fields. You can set attributes for the user-defined field, such as making the field mandatory, by creating rules for entity types. For details, see Set up rules. If a user-defined field is Required, but the default Smart View form for adding an item does not display the new user-defined field, ALM Octane still prompts you for a value in the Other Required and Invalid Fields section. This section displays only when needed. If a user-defined field (UDF) is no longer relevant, you can delete it. In your entity, select the user-defined field in the grid, and in the toolbar, click the Delete button X. Entity Forms Fields are cleared from a form the next time the form is opened. Rules A warning is displayed. All rules containing the field are invalid and deactivated. For current status graphs, a message is displayed that the graph configuration is no longer valid. Modify the existing configuration as needed. Delete the widget if you cannot modify the existing configuration. For trend-based graphs, the field remains in graph data. Fields in filters are cleared with a message. Reset the filters (either in the grid or in the dashboard configuration) as needed. Sorting order The field is cleared from the sorting with a message. Grid displays The field is removed from the grid display without a message. Favorites Fields in a favorite are cleared without a message. In addition, the name of the field remains in the server audit log. You can change the display names of both UDFs and system fields. Tip: ALM Octane also lets you change display labels for entities. For details, see Customize entity display labels (Enterprise Edition). Click Entities > Fields, and select a field. Modify the Label field and click Save. Troubleshooting: After I modify a field label, users do not see the new label in grids. Some grids list multiple entities in a combined view. To display correctly, the field labels for all the entities have to match. Backlog grid Includes defects, user stories, and quality stories. Includes manual tests, Gherkin tests, test suites, and automated tests. Run grid Includes manual test runs and automated test runs for test suites. Solution: In Settings, change the label for the field for all relevant entities. Defects, quality stories, and user stories have an Author field. You want to change the label from Author to Creator. In Settings, modify the Author field label to Creator three times, once for each of the three entities separately: Defects, quality stories, and user stories. The combined Backlog grid in ALM Octane displays the Creator label correctly. Limitation: If a field is not available for all entities in the combined grid, ALM Octane does not display the new label.